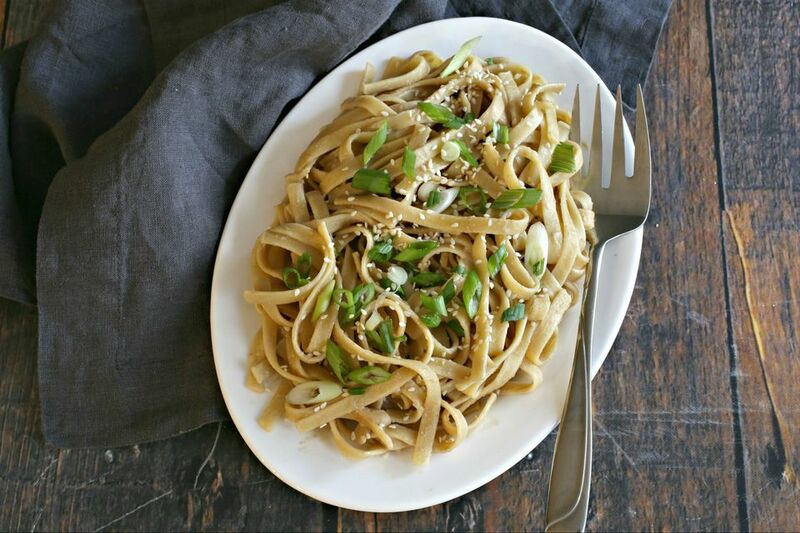 Tahini sauce on pasta? Oh, yes! Just think in terms of Thai peanut sauce, but with ground sesame paste instead of peanut butter and suddenly the idea doesn't seem so strange at all. In fact, sesame paste can be used as a substitute in almost any recipe that calls for peanut butter. Tahini—or sesame paste, depending on how it is labeled—is a condiment that is made up of toasted and hulled sesame seeds that are then ground to a paste. It's most commonly used in the cuisines of the Middle East as well as parts of the Mediterranean and North Africa. More recently, it's begin to show up in health food stores in the United States. These days, it is common enough in the U.S. and can be found both in ethnic markets as well as large supermarkets. You will typically find it either in the ethnic foods aisle or with the other nut and seed butters. Like other seeds and nuts, sesame seeds have a high fat content—when you open the tahini jars, you may find some of the oil floating on top like natural peanut butters. Just stir to combine and refrigerate after opening to extend the shelf life. Along with healthy fats, tahini is a good source of protein, calcium, and manganese and is a great ingredient for vegetarian and vegan diets. Like nut butters, tahini is extremely versatile and can be used in both sweet or savory recipes. It makes a great dressing for roasted vegetables, salads, falafel and shawarma sandwiches, fish and chicken. It's also a classic ingredient in chickpea hummus, adding both a nutty flavor and creamy texture. In this pasta sauce, flavor and salt come from the addition of soy sauce and the acid from the lemon is balanced by a bit of honey. Ginger adds a hint of heat, but you can also adjust the levels with more or less red pepper. The result is a creamy, balanced sauce that's great hot or cold. Bring a large pot of salted water to a boil and add the pasta. Cook according to the package directions. In a bowl, whisk together the sesame paste, water, soy sauce, lemon juice, honey, grated ginger, garlic, and crushed red pepper flakes until smooth. Drain the cooked noodles and toss with the tahini sauce. Top with the chopped scallions and sesame seeds. For a fun variation, try adding in stir-fried shredded carrots and roasted chickpeas for additional flavor and texture.